Yeah, that's the kind of scene where I turn into a beast and beat him up with my fists. 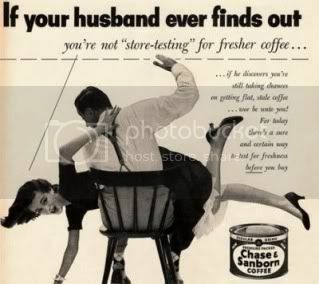 I'll tell ya, Savanna, some of the old ads I've seen are just so wrong and portray women in such a bad light...this is one of the tame ones, which is so freaking sad! It is sad, and it's the kind of atmosphere I grew up in, and fought like mad!